The Public Safety Committee Monday said the proposed changes don't reflect the more than one year of work done by a citizen coalition to increase the authority of the Citizens Police Review Board. DALLAS — Dallas Police Chief U. Renee Hall attempted to walk a fine line Monday between the call for greater accountability for officers in police/community interactions while also protecting the constitutional rights of officers facing potential criminal investigation. 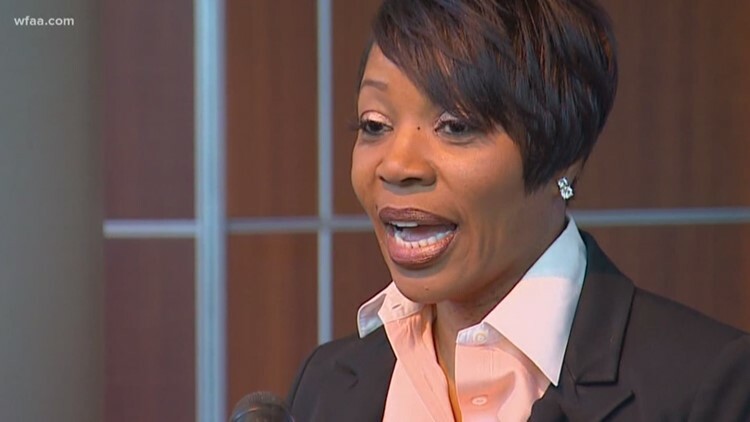 Hall was met with varying levels of opposition from Dallas City council members, the Dallas Police Association and the community coalition that has been spearheading efforts to strengthen the Citizens Police Review Board since shortly after Hall arrived in Dallas in September 2017. "Everybody has a different view of what oversight should look like," Hall acknowledged after a 90-minute briefing to the Public Safety and Criminal Justice Committee. "As a leader in this city and the national conversation, we have to have a relationship that builds trust," Hall said. Hall presented a plan she described as a combined product of the Community Police Oversight Board Coalition, the current CPRB and DPD. While there is broad support for some aspects of the plan presented Monday, multiple groups do not agree on an essential part of the remake, the creation of a "critical incident review" panel. Critical incidents for police include officer involved shootings and use of force incidents. The plan calls for giving the CPRB the ability to create a panel to review a DPD investigation of a critical incident - only after the investigation is complete. The proposed change would also not allow the CPRB to subpoena officers involved in criminal incidents. Changa Higgins, the head of the 21-member coalition of community groups, says the ability to subpoena officers is central to meaningful reform of the CPRB. Another aspect of the proposed critical incident review panel also met resistance from police groups, including the Dallas Police Association. Hall wants the panel to convene the panel immediately after a critical incident and consist of three CPRB members, along with members of a community advisory board and a non-specific "clergy board". “I have a problem with the critical incident panel," DPA president Mike Mata said after Monday's briefing. Mata said he has concerns over the qualifications of those serving on the panel and wants to ensure volunteers complete training and education on DPD investigative procedures before being allowed to serve. Dr. Brian H. Williams is the current chairman of the Citizens Police Review Board, which formed in 1987 after concerns over a number of officer involved shootings. Williams, a Parkland Hospital trauma surgeon, was appointed by Dallas Mayor Mike Rawlings to the CPRB after he spoke out against violence after the July 7, 2016 attacks that killed 5 Dallas officers in downtown. Since his appointment in December 2017, he says he has worked to strengthen the CPRB and said Monday more work is needed to reconcile the difference between what the citizens coalition wants (power to subpoena officers and independently investigate critical incidents) and what DPD and Hall advocated for on Monday. “Right now is a chance when we have relative calm to do something that nowhere else in the country is being done,” Williams said. 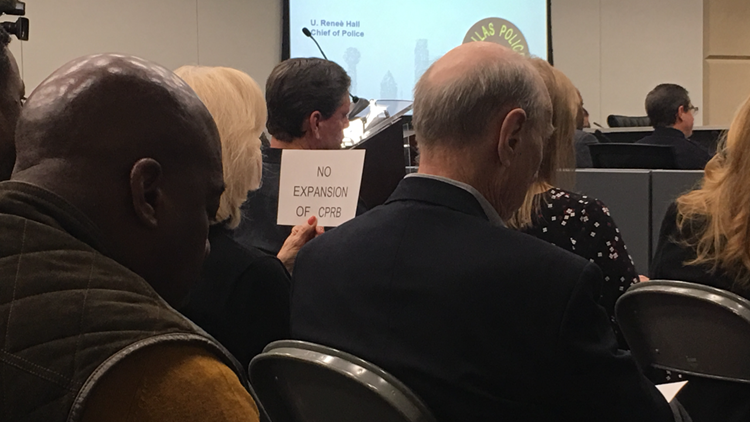 An audience member holds a sign that discourages the city council to increase power of the Citizens Police Review Board during a meeting of the Public Safety Committee on Monday February 11, 2019. District 14 council member Philip Kingston said he could not support the proposed requirements for CPRB members to complete the Citizens Police Academy and police simulator training. Multiple council members also objected to the proposal of reducing the CPRB from it's current 15 member council-appointed structure to a body consisting of 7 to 9 members appointed by another body. A handful of audience members on Monday held signs urging the council to reject any changes to the Citizens Police Review Board, calling the attempts at reform "anti-police." Assistant City Manager Jon Fortune told the committee the next step is for the entire council to receive a briefing on the proposed changes on March 20 before potentially drafting an ordinance for council approval at a later date. District 12 council member Sandy Greyson told Hall before the briefing concluded there was no need to present the same proposal next month because it's clear it doesn't have support of the committee. Hall afterwards said she is open to making changes, but to not expect major differences by next month. "If we’re waiting for a product where each and every person involved in this process is going to agree, we will be here for another 30 years," Hall said.